Salmon Lake Resort has been a long time favorite, offering a range of accommodations. Choose from staying at one of our lake front cabins, at our campground or in one of our serviced sites in our RV Park. Salmon Lake also has a boat launch, store and rental shop. Salmon Lake Resort has been a long-time favorite for many returning guests, year after year. Situated on the shores of Salmon Lake, the resort is the perfect getaway for the entire family. Guests can relax and enjoy great fishing for Kamloops rainbow trout, swimming in our outdoor solar heated pool, and much more. Your choice of accommodations at Salmon Lake includes 11 modern lake front cabins, campground and a RV Park. Amenities at The Salmon Lake Resort include a convenience store stocked with "the basics" for groceries, a selection of artificial flies, fly fishing equipment, ice and souvenirs. A central washhouse with coin-operated showers and laundry facilities, fish cleaning shack, solar heated pool, swing set / playground for children and a horseshoe pit are also on the property. 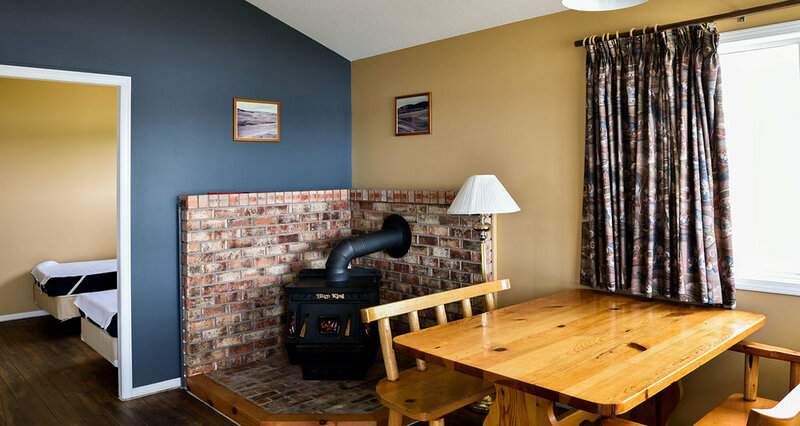 Our cozy one and two bedroom furnished cabins provide guests with a beautiful view of Salmon Lake and include a full kitchen with refrigerator, range, cookware, dishes and cutlery. For your comfort, each self-contained unit features electric heat and a wood burning stove, plus a bathroom equipped with a shower. Guests are also able to bring their own BBQ to operate at the resort if they chose. Linens are available by pre-arrangement for those wishing not to pack along personal bedding and towels. We are pleased to offer our guests several options for camping on Salmon Lake; full service RV sites, RV Plus sites that include septic service and dry camping sites. If you are looking for something a bit different, consider staying in the Salmon Lake Yurt. Salmon Lake Resort is the perfect choice for a country wedding. For information on events and tent rentals at Salmon Lake Resort please contact us. The spring fishing at Salmon Lake boasts that of true consistency. The lake's opening date usually falls after turn-over, therefore kicking off a great spring season of catching rainbow trout. Typical hatches of Chironomids and Mayflies are generally the first insect movements. At the same time, Leeches, Freshwater Shrimp (Scuds), Damsel nymphs, Dragonfly nymphs are all on the move as the waters warm up. During the warmer summer months, the fishing remains steady, for those who choose to search the depths with sinking lines. Larger common attractors and Leech imitations are the ticket during the summer fishery. As Fall starts to show its colors, the waters cool down and fishing can take place in the shallower shoals. Typical Chironomids start re-emerging in smaller amounts. Salmon Lake Resort has 12' fishing rowboats for rental. As well, gas powered motors or electric motors and batteries are available. Guests are also able to bring their own boats to the resort, please also note that there is a 10 HP restriction on the lake. There is a secondary dock in place near the boat launch that has ample space for non-resort rental boats. Please note that cabins accommodate up to four people. No tents, RVs or campers permitted. Long weekends: 3 night minimum stay applies. Check in time is 3pm and check out time is 11am. A 'quiet policy' is in effect from 11pm to 7am. Note that fishing is restricted to artificial flies on a single barbless hook. Please consult the BC Freshwater Fishing Synopsis for more information regarding catch limits and gear restrictions. Pets are welcome and must be on a leash at all times. ATVs and dirt bikes are not permitted on the Ranch property. Please note that Salmon Lake Resort operates on a seasonal basis only.